Warning, warning! This is not a drill! In the event of stress, bad days, or quarrels, THIS is the go-to solution recommended by professional spouses everywhere. Created with you and your sweetie in mind, this emergency kit will help you prepare for (and survive!) any type of couple calamity—guaranteeing you both emerge unharmed and stronger than ever. With over 20 crucial elements contained in a DARLING one-of-a-kind love box, you’ll be 100% ready for when disaster strikes! Pretty cool, huh? 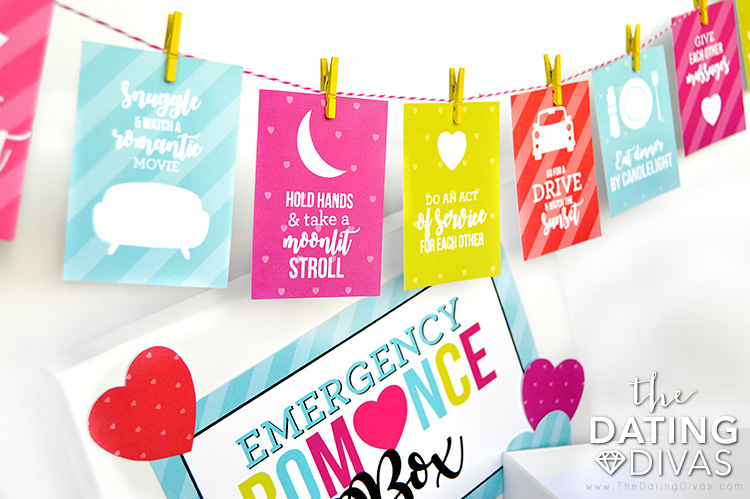 This Emergency Romance Box is truly unique. 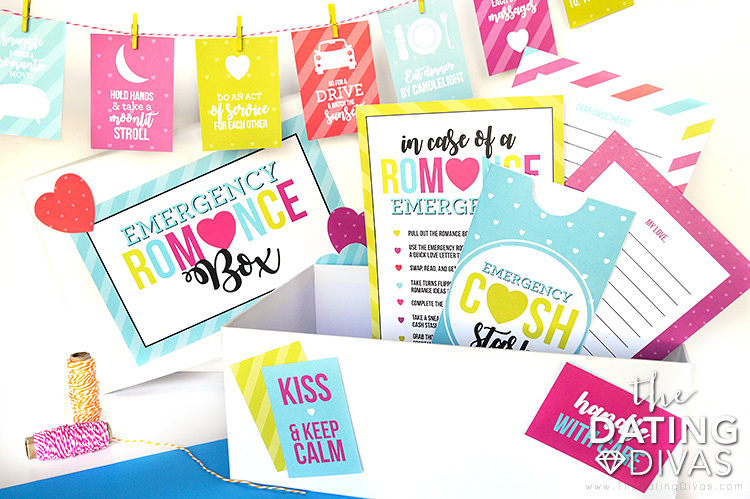 Our Emergency Romance Box would not have been a reality without the help of the wonderful Carisa from Messes to Memories! Her designs truly helped ‘save’ the day! As mentioned above, this is one adorable DIY kit EVERY couple should have. It’s cute, colorful, and so easy to use (what could be better?!). 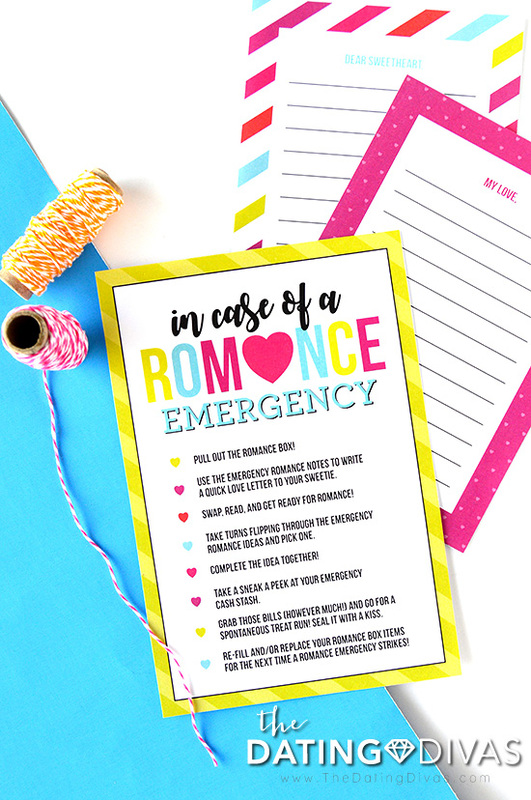 Plus, all of the coordinating printables really work to pump up the romance factor whenever it’s in need of a little resuscitation. Crafting your box is as easy as pie and we’ll help walk you through it! Begin by getting your hands on a lidded box (a shoebox will work in a pinch!) and printing the downloadable pack at the bottom of this page. 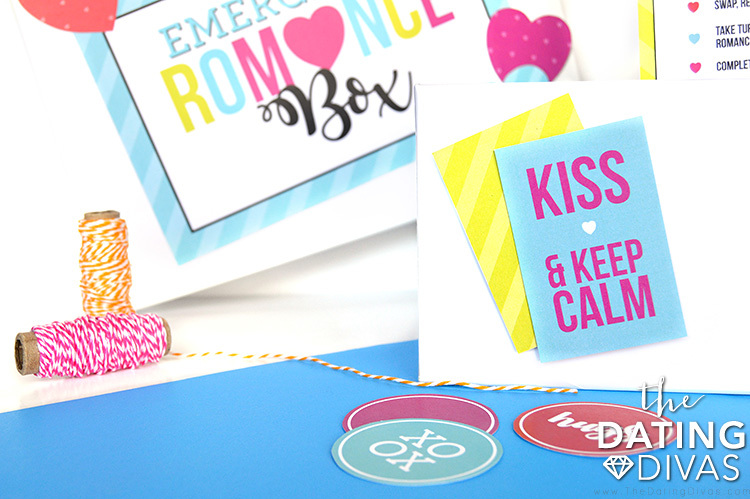 Affix the box cover, cut and trim the remaining printables, and you are ready for rescue. Don’t forget to include a few embellishments! They’ll really help you make the box your own, while also offering some fabulously romantic reminders. Slap a few on the inside, outside, or lid for a jazzed up box of goodness that can’t be beat. Once your box has been all sorts of blinged out, it’s time to add the interior goodies! Each of the included activities and ideas are not only fun but also work to bring back that lovin’ feeling whenever it’s looking a little lost. 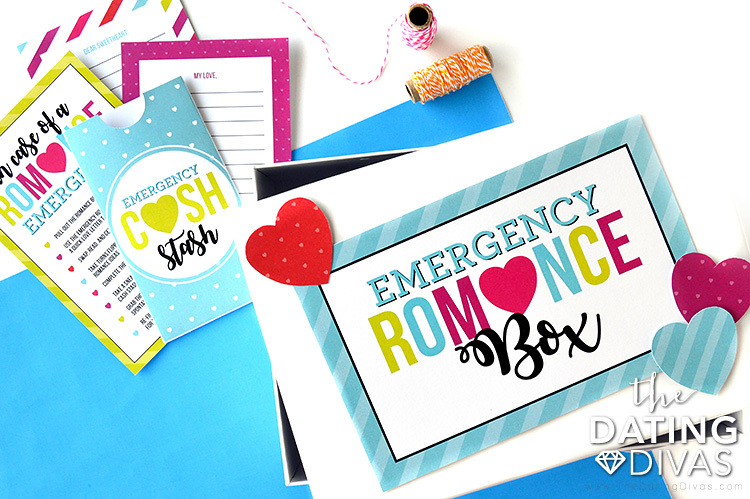 Our In Case of a Romance Emergency Card is not only a great visual addition but also contains your step-by-step disaster plan and instructions for using the box. Be sure to give it a look now so you know exactly what to expect! Steps include such dazzling delights as exchanging love letters using the included stationery, an emergency cash stash envelope for a spontaneous treat run, and selecting from a host of easy and romantic couple ideas to put the plan into action! Consider placing the card on the very top of your box contents so it’s ready and waiting for it’s time to shine. 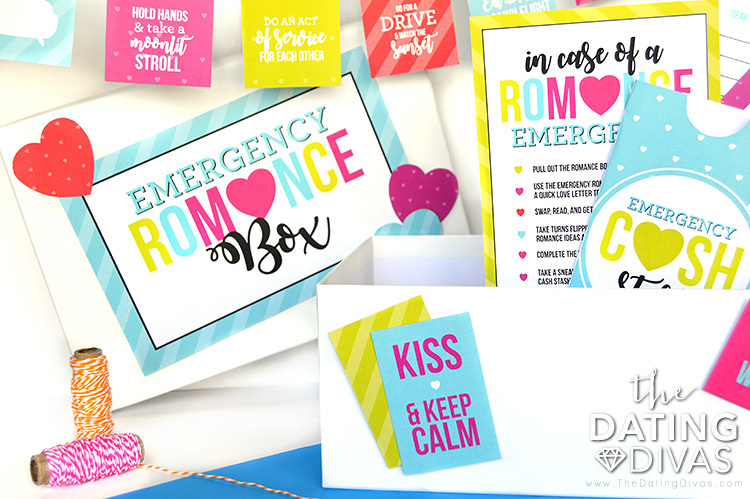 When disaster strikes and love is lacking, your Emergency Romance Box is there to save the day. Who knew emergency prep could be so fun?! For even more couple planning fun, be sure and check out our Date Night Hubby Helper and our one and only Date Night Guide! We have a box but my husband made it for me!!! :) He gave it to me last Chirstmas, and we use it to put all of our special things in. Thanks for the idea though. It would be fun to use a shower gift. I love mine, you are so creative! I'm loving mine! My friends all want them now too. Ha! Guess I know what to make in bulk for Christmas time. Love you – this was a great idea! Lovin' our box too…….still need to fill it, that will be fun! Ummm I REALLY love this. I can’t wait to make mine!! What a cute and wonderful idea to have ready for when arguments occur or life starts getting in the way. It’s always good to be prepared AND to show your love to your sweetie!! Oh my gosh, Elizabeth! This is absolutely darling! I love this idea, because life can always just get in the way of romance – this will be my new emergency stash! This is DARLING Elizabeth! Such a great idea for when life gets busy! This is so adorable! I love all the little romance idea cards! 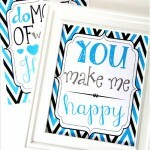 I’m SO in love with these printables!! SO CUTE! !